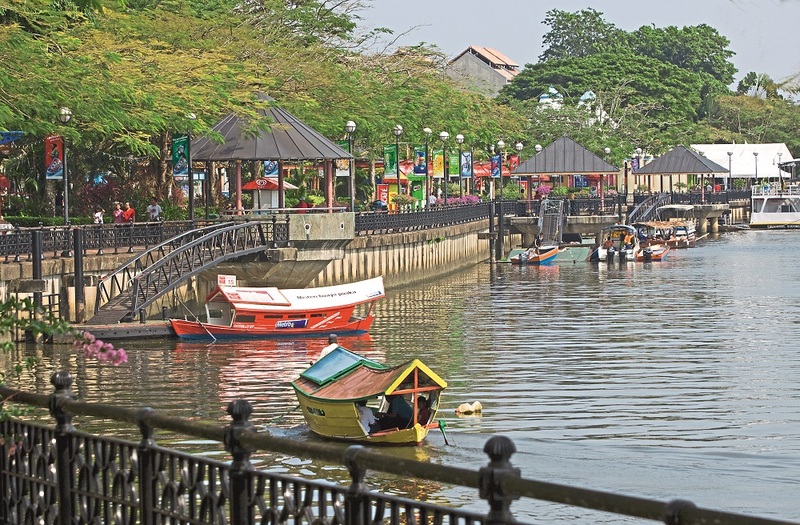 East Malaysia, on the island of Borneo, has many appealing qualities and the Sarawak capital of Kuching offers a relaxed and yet, vibrant setting. 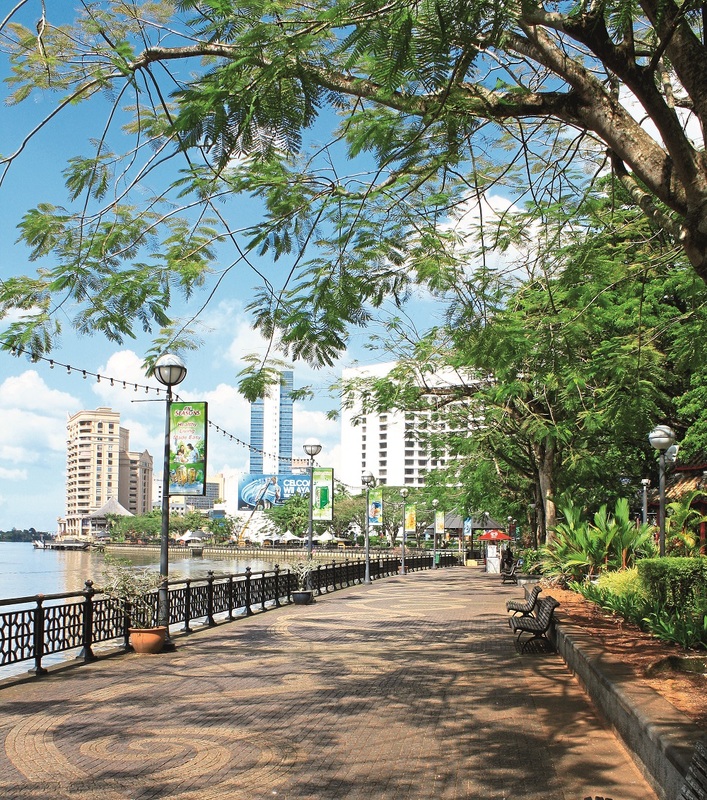 The riverfront district along the Sarawak River, in downtown Kuching, is now an open space used mostly for recreation. It’s a lively pedestrian-only precinct that is frequented by the locals who use it for leisure activities, to enjoy a sunset drink, or have a meal beneath shady trees. A fascinating part of this riverfront area is the street named Main Bazaar which runs alongside the river. Retail shops, bazaars, and a few dining outlets front the street but there are numerous uniquely Sarawakian and Bornean products sold in the shops here to ensure that the bazaars are a bit more bizarre than mainstream. The former trading houses, or go-downs, along Jalan Main Bazaar offer an intriguing insight to the area’s historic activities before it became a major tourism precinct. With awnings providing shade, it’s easy to amble along here, and the best place to start your walk is at the former Court House which has recently been converted to an amazing lifestyle concept under the ChinaHouse banner. What were once go-downs for goods unloaded at the riverside docks are now mostly craft and souvenir shops selling items from Borneo. These old shops with captivating names present a face of a bygone era – names such as Dayak Art, Sarawak Steamship Berhad, and Haiyen Bird’s Nest offer some intrigue before you even step inside. Visitors can take a leisurely stroll along the riverfront to explore its historical buildings and also simply to admire several modern sculptures, an open-air amphitheatre, and the musical fountains. The area has changed dramatically from 1839 when English adventurer James Brooke landed here and so began the era of the White Rajahs. James Brooke, who was then attached to the East India Company and based in Singapore, sailed up the Sarawak River seeking his fortune from bounty such as diamonds and gold. He earned the respect of the Sultan of Brunei – this part of Sarawak was then under his jurisdiction – for helping suppress a rebellion amongst the locals and his even-handed intervention that relied upon peaceful means rather than the use of force. He was rewarded and given the title of Rajah and Governor of Sarawak. Legacies of the White Rajah era are evident in several riverfront landmark buildings including the former Court House built in 1871 (now ChinaHouse). This makes a suitable starting point for a walk of discovery, as there is an obelisk dedicated to Brooke situated on the clock tower here. Immediately behind the clock tower is ChinaHouse (same owners and concept as the very successful ChinaHouse in George Town, Penang) which has made an immediate impact upon the design conscious, café society in Kuching. This sprawling space is centred on grassy courtyards and includes a smart coffee and casual dining concept, a more formal dining space, concert area, art space, enticing retail concept, and bars. ChinaHouse offers a lifestyle precinct that could easily distract visitors for hours and even forestall the urge to take the recommended walk along Jalan Main Bazaar. The riverfront has undergone several transformations since the 19th century. It has moved on from its village origins with simple attap buildings to a busy river port with warehouses and docks, and finally, to the landscaped riverside promenade that it is today. 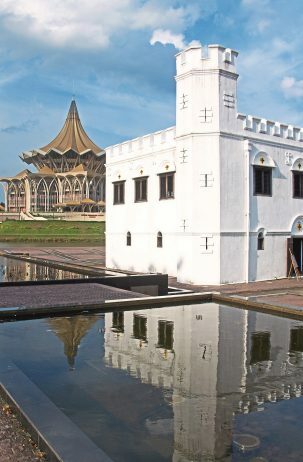 Several buildings, constructed here to cater to Kuching’s earlier development as a port and administrative centre, have been restored and are worth visiting. Just opposite the old Court House, for example, is the Sarawak Steamship Building which has now been converted into a retail space. Return to the sheltered awnings along the Main Bazaar and past small budget hotels such as Wo Jia Lodge and Kuching Waterfront Lodge. Continue to the Jalan China intersection and turn right to the No. 9 shop-lot where you’ll find souvenirs sold and signs still advertising Yeo’s Tattoo outlet, which was also once located here. Mr. Yeo, who helped popularise Sarawak tribal tattoos, is now in his 70s and has retired. Several of the state’s ethnic communities are noted for their body tattoos. Sadly, those interested in a tattoo will now have to go elsewhere. Back on Jalan Main Bazaar, Johns Gallery Dayak Art at No. 62 has one of the finest collections of Bornean tribal and primitive art. 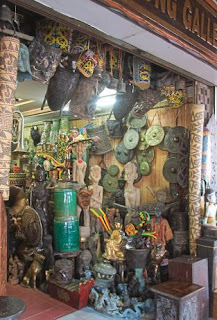 The specialty here is teak wood carvings with some museum-quality pieces as well as more contemporary and commercial items. There is a fine selection of Chinese gongs, brass cannons, porcelain carved doors, and daggers. Continue walking along the shaded riverside promenade looking for the brass plaques on the cobblestone pavement, which provide an informative outline of historic events and sites of interest along the way. At the end of the street is the easily identifiable green- and red-coloured Tua Pek Kong Temple. It was erected in 1876, making it Kuching’s oldest temple in any case, although some believe it to have been built in 1843. 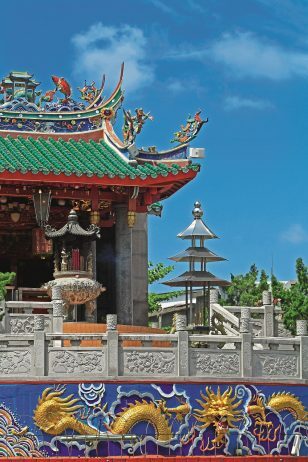 The temple is one of the city’s more prominent landmarks where the Chinese pray to the Tua Pek Kong deity. The Hilton Hotel is located just a little further along the road and the Pullman is around the corner and further up the hill. Walk across the road to visit the Chinese History Museum (open daily from 9am to 4:30pm). A good dining and drinking option along the riverfront is James Brooke Bistro and Café, which occupies an excellent location beneath tall shady trees. Another choice is to go on a sunset river cruise aboard the Equatorial. No one will return home empty handed from the Main Bazaar as the selection of traditional brassware, pottery, ceramics, tribal and ethnic arts and craft, prized local Sarawak pepper, wood carvings, masks, blowpipes, and shields is enough to tempt even the most reluctant shopper. On the other side of the Sarawak River, life is much slower and more sedate. The famous landmarks on the other side of the river, Fort Margherita and the Astana, have been joined by the modern structure of the Sarawak State Legislative Building in all its grand elegance. While some may see this building as out of place among the low-rise structures on this side of the river, others will admire for its representation of contemporary Sarawak. Fort Margherita, built to protect the city from possible attack, commands a strategic position along the Sarawak River. It has been converted to a Police Museum and many of its old cannons, guns, scenes of hanging and, other forms of criminal punishment, are displayed. In the distance, it’s possible to see both Mounts Serapi and Santubong, and at dusk, life along the river itself mostly stops but the riverbanks spring to life as city residents come here to make the most of the cooler part of the day. 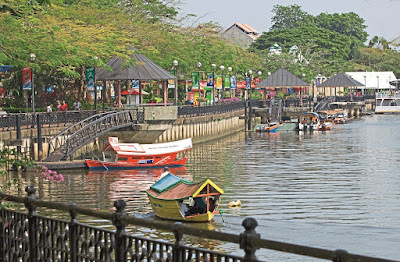 The Kuching Main Bazaar riverfront precinct is one of Malaysia’s finest stretches of open space that includes cobblestone paths, landscaping, shaded areas, and observation towers. Sarawak Tourism has produced a map, the Kuching Heritage Map. Which is a useful aid for exploring Kuching’s main downtown attractions.